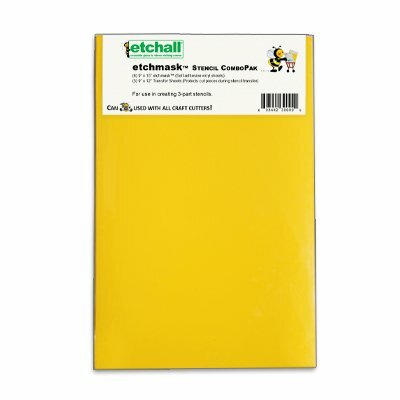 etchall® etchmask is a glossy adhesive vinyl used when creating stencils. It adheres to glass surfaces preventing etchall® etching crème or etchall® dip 'n etch to slide underneath. This gives sharp lines and a smooth finish to the design. When using etchmask to cut your own stencil designs, please see our instructions for etchmask. Etchmask vinyl is also compatible with all digital craft cutters such as Silhouette SD, Cameo, Cricut, etc. Create your own etching stencils using etchall® etchmask and etchall® transfer sheet. Think of a stencil as a sandwich, two pieces of bread and cheese in the middle. The top bread is the transfer sheet, the cheese is the etchmask and the other bread is the glossy sheet that the etchmask sticks to. Glossy adhesive vinyl used for creating stencils. Adheres to glass surfaces preventing etchall® etching crème or etchall® dip 'n etch to slide underneath. Compatible with all digital craft cutters such as Silhouette SD, Cameo, Cricut, etc. If you have any questions about this product by Etchall, contact us by completing and submitting the form below. If you are looking for a specif part number, please include it with your message.